In America today, guns are often confused as a symbol of masculinity and power. This misconception has been brought about through years of exposure to media images of powerful men with guns defeating Native Americans, Russians, Terrorists, and Orcs. People in this demented nation of ours spend millions upon millions of dollars a year that could actually be used to improve the lot of themselves and those around them in the faint hopes of appearing to be what they are not. But that is beside the point, because I’m not talking to them….I’m talking to you. Yeah…you. Sitting there on your couch reading this right now. Not somebody else. Not the other guy. Don’t sit there thinking this is some abstract, philosophical exercise that you can remove yourself from while you sit back in judgment of some fictional, moronic cross-section of the American public. It’s not. I’m talking to you. Directly. I can see behind the absurd little lies you tell yourself in order help avoid the painful truth that you are the guy on the beach who gets sand kicked in his face by people like me. The reason you own a gun is because you are a weakling. Sure, I’ve heard all of your arguments. “The Second Amendment says that I have the right to carry a gun.” You are hiding behind some document that some dudes in wigs wrote 2000 years ago. Everybody who owns a gun is a constitutional lawyer (except when it comes to, you know, the other 26 Amendments). Do you know how utterly hysterical it is to watch you switch from doing your Stallone impression to pretending to be James Madison? “Yeah, I’m a tough guy, but I got smarts too!” (read that last part in your best Fredo Coreleone voice) Put down your law books and we can see what’s up, Tough Guy. “But, it’s just for hunting.” Sure. You bought that military grade A4 assault rifle that fires 80,000 rounds per second at Walmart so that you can stop a deer from trying to get away. Ah….yeah…that’s it. The truth is, you bought it because you know that if it ever came down to it, I would beat you like a rented mule. That little survivalist fantasy you keep conjuring up in your mind is simply a distraction from the simple truth that you are afraid to catch a beating from me. 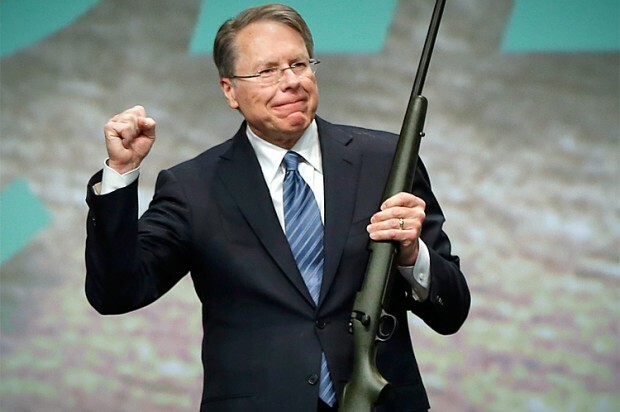 I look at Wayne LaPierre, the little geek who runs the NRA, and my first thought is, “wouldn’t it be fun to push his face into a vat of french fry oil at my neighborhood McDonald’s”. If I had that guy in a room for 15 seconds, I’d have him singing the Soviet National Anthem and screaming “Obama in 2016”. Another one of those pasty, bloated old guys who think that having the ability to shoot up a room full of strangers makes people forget that he looks like 140 pounds of whimpering, soft serve ice cream. I’m right here, Tough Guy. Anytime you want. As much of a cowering little baby that LaPierre is, he’s not even half as sad as you are. “Oh, but I need it to protect my family.” Way to hide behind your children, Ace. See, I’m not a threat to your family. Just you. You are scared that I’m going to drag you through the town square from the back of my Lincoln while all the kids laugh and throw rocks. The sheer volume of humiliation that I would heap upon you is why you’re up at 3 o’clock in the morning trying to figure out if it is legal in your state to own a bazooka. “But, Obama is coming to get us!” Do you see how silly you sound? All these movies you watch cater to this depressing little fantasy that you are so powerful and cunning that the government actually cares about anything you do. Obama doesn’t care whether you have a gun or not. As a matter of fact, Obama doesn’t care about you at all. He lives in some insulated bubble in Washington, surrounded by hundreds of Secret Service agents, old rich people and really good chefs. Are you really so deluded as to believe that Obama would take a second out of his day to punish some coward sitting behind a computer keyboard typing nasty things about the Kardashian sisters on a Facebook thread? Obama is not your problem…I am. Your little comedy act is over. Just remember, the next time you buy that copy of Guns and Ammo at the newsstand in order to show what a big man you are, I’ll be there. The next time you swagger out to the range to go kill a bunch of cardboard cutouts of Bin Laden, I’ll be there. And when you are sitting around the locker room pretending to be Mr. Expert, bragging to the fellas with all those fancy expressions like “muzzle breaks and recoil compensators”, so proud of yourself that you used the word “aught” in a sentence, I’ll be there too. No matter how much you spend on weapons, no matter how many times you practice that thing that Clint Eastwood does with the side of his mouth in the mirror, no matter how many tough talking, pro-violence idiot politicians you support, you can’t avoid me. Don’t you see….I’m inside of you. This entry was posted on December 19, 2013, 10:42 AM and is filed under Here's Why I Dislike You So Much. You can follow any responses to this entry through RSS 2.0. You can leave a response, or trackback from your own site. As chance would have it, the latest ad from Cavela’s was delivered with my morning newspaper, and just in time for the Season of Joy and Firepower. They have a really nifty assault rifle on sale for only $599. Get ’em while they’re hot. Comes with several 30-round clips at no extra charge even, and a laser range finder is only a little extra. Bambi ain’t gonna escape this year! Yee-haw! I always cheer for the hunters in Bambi. I’ll admit it is a character flaw, but honestly, I’m concerned that if cartoon deer were to overpopulate, they would eat the bark of our trees away creating a global shortage of oxygen. Good point. Actually, I suspect that deer are closely related to goats and will eat dang-near anything not meat, including my pant-legs if I get too close. It’s just that the image of one of them mowed down by a full magazine and looking like swiss cheese, well, it was just too much to resist. Right. Just be aware, the EPA has discovered that the primary source of lead poisoning is venison. Most states don’t allow you to hunt with a weapon that holds more than three rounds. In my experience, the game wardens are intolerant of rule-breakers and better armed. The assault rifle with the 30 round magazine is sold to morons who think a few more bullets will give them an edge against a drone that can kill them from outside the range of their weapon or a pack of spec ops using a laser to guide a bomb onto their house. Pure marketing. Ha! The second paragraph had occurred to me on a few occasions. I’m not clear that “Dude with a Really Powerful Gun” stands much chance against the almighty power of The Man. Glad you are thinking clearly, John. Unfortunately, there seems to be no shortage of 30-round-clip morons. When I did a search on clip size I did find the three round number, but it seems to apply only to shotguns. There seems to be some kind of 10-round limit on rifle clips, but it’s vague. I agree with your conclusions. Interesting. I just did a search and the limit IS up to 11 rounds in Missouri and Michigan (where I’ve hunted). It was three when I went through hunter safety 20 years ago. I guess we’re poorer shots now. So…you think Anson would agree with me on this one? Ha!!!! Do you think there is a chance we could schedule some sort of blogger boxing match between Anson and I? Please let this not be mere parody … please please please. OK, some parody is fine. Honestly, I can’t tell the difference between satire and reality anymore. It’s easy: reality is funny and satire is insightful. Nice! That’s about as perfect as it can be stated. I also think some folks delude themselves and act like a Bruce Willis type all-American hero. They are just looking for the simplest excuse to shoot. That’s because they haven’t heard that awful “Return of Bruno” album he recorded. If they heard that, they’d sober up in a hurry. There is nothing innocent about socialism. Well, let’s not put that theory to the test. Nope. I have no desire to fight you or anyone else. But I have no problem putting a couple rounds in your “center of mass” if you threaten me sufficiently. Basic rule, don’t scare an old fart, a Vietnam veteran, because he may just may kill you. Good….you are not the target audience (pardon the pun) on this one Sir. It has much more to do with the roots of the hyper masculinity that have corrupted the gun culture over the past 40 or so years. But, if I jump out from behind a tree wearing a goblin mask, ask questions first! I was feeling pretty satisfied with my self when I read this article, thinking, OK, I’ve got a .22 rifle, a .273 varmint rifle and a 12-gauge shotgun in my Arsenal For Democracy, but they’re all single shot (except the shot gun, which can selected for single or double barrelled shots, but why be too technical), so aught to worry about being too heinous a perpetrator. Then I remembered. Oh, oh … the .22 has a six round clip. AAAAAAAH! I AM REALLY A BAD, BAD PERSON!!!!!! I don’t think you are a bad person, I just want to punch you in the face.